I think this recipe would be a perfect addition to a Thanksgiving brunch. The children in our family love pancakes, and this version fits the season quite well due to the addition of cranberry jam. It doesn’t hurt that the pancakes have a unique look to them as well. The recipe starts like any pancake recipe. The one challenge is actually fitting the jam into the pancakes, and to make that possible, I cooked them in an aebelskiver pan. 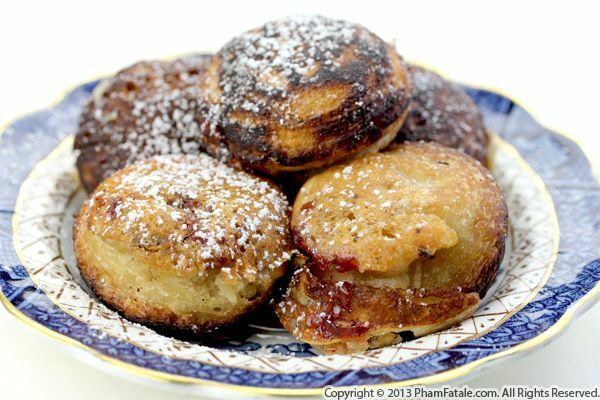 Aebelskivers are round pancake balls that taste similar to crossbred doughnuts and popovers. I usually use this pan for a Vietnamese dish called bánh khọt, which is a savory Vietnamese-style rice flour pancake. You've probably seen it in a flat-version (bánh xèo). Today, it made lovely, fluffy pancakes filled with a dollop of sweet/tart cranberry jam. If you prefer, you could fill them with candied yams, though I think there wouldn’t be as much textural contrast. This is definitely a recipe to learn, as it’s easy to adapt to any season or occasion.